Inkjet printers can be divided into three categories when it comes to ink cartridge design. The first type is a cartridge that not only incorporates reservoirs for the ink, but also houses the print head. In one sense, this arrangement is good because you get a brand new print head each time you replace the cartridge. However, historically, these types of cartridge have been expensive to replace and some argue that a permanent print head is often of higher quality and better specification, enabling faster and better-quality printing. The second type of cartridge only contains the inks. These are cheaper to replace than those with integrated print heads but when one colour is depleted, the cartridge may still contain a considerable amount of ink in the remaining colours. The third type is the single ink cartridge. As its name implies, only one colour ink is contained and you only need to replace it once it has been depleted, theoretically saving yourself ink. There is a snag with this assumption because when you change a single ink cartridge, the print head must be primed and this usually involves priming all the cartridges, so ink does actually get wasted. In order to avoid the ‘domino’ effect – when replacing one cartridge empties a near-empty neighbouring cartridge, etc. – it’s advisable to replace any nearly empty cartridges at the same time as an empty one. Some cartridges, notably with some Canon models, have transparent reservoirs, revealing exactly how much ink is visibly remaining. 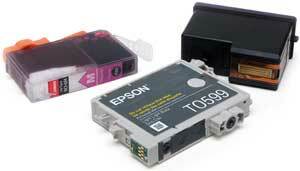 Others, notably Epson, have cartridges that log their use and prevent further operation once the ink has exceeded an estimated level. This is enabled by an on-cartridge chip and is important for Epson printers because they use a piezo electric print head that is vulnerable to air-locks if the cartridge runs dry.